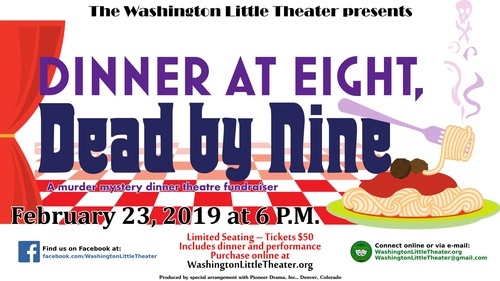 Come enjoy a delicious catered dinner and then a hilarious murder mystery comedy. All proceeds go to support improvements and repairs around the Bolton Lunceford Playhouse. Please note, due to this being a dinner theatre production it will be performed at The Carriage House at RedBrick Manor instead of the Bolton Lunceford Playhouse. Because this is a fundraiser, Season Tickets are not usable. For questions, email WashingtonLittleTheater@gmail.com or visit our Facebook page at facebook.com/WashingtonLittleTheater. Tickets are $50 a piece and include a meal and show.